This rare example of living culture heritage is available for private charter! 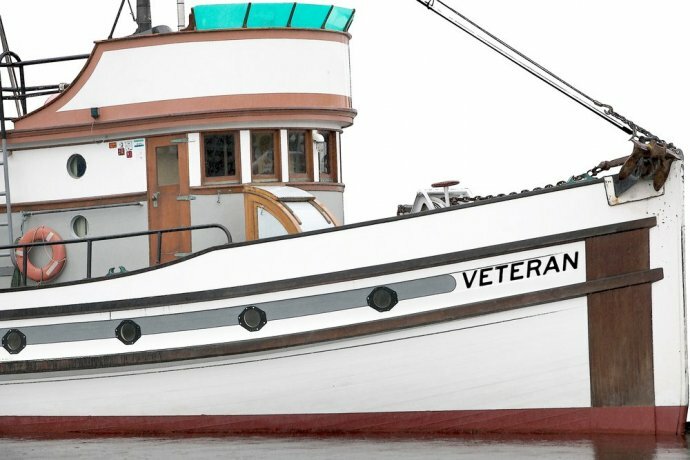 The Skansie purse seiner Veteran, launched in 1926, is a beautifully restored sample of one of the most recognized and significant vessel designs to have originated from Gig Harbor. One of over 100 purse seiners constructed during the 1920s and 1930s at the Skansie Ship Building Company, Veteran and her sister ships were widely recognized as the state-of-the-art purse seiners of their day. Veteran and sister ship Avalon were retained and operated by the Skansie family which, like many Gig Harbor pioneer families, commercially fished for salmon and bottom fish in the waters of Washington State. The Veteran has been carefully maintained to preserve the original design and character and is still able to participate in today’s commercial salmon fishery. Beginning in September 2017, this beautiful vessel is available for private charter. All charters include a USCG licensed skipper. Rates for up to five passengers begin at $1,000 for up to four hours. Use your imagination to craft your dream trip — we will work with you to create an itinerary that can include a variety of Puget Sound destinations, including day and overnight trips. Please contact Gig Harbor BoatShop at (253) 857-9344 or email info@gigharborboatshop.org to inquire about rates and availability. Provide your desired destination(s), date(s), and time(s) for the fastest response. Please note all charter passengers must be at least 18 years of age.